Brush your truffles under a thin shower of cold water. Dry them thoroughly. Cut them in half. In the middle section cut 4 thin slices using the mandolin; Set them aside in a hermetically sealed container with a bit of olive oil (or any other good oil). 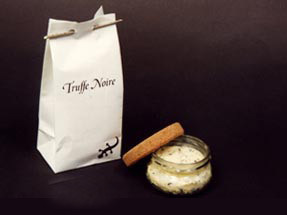 Grate the rest of the truffle using the large part of a cheese grater; Add to the crème fraiche. Put in hermetically sealed container in the fridge for a few hours or for several days (2-3 days). Place the pieces of poularde in the bottom of a saucepan with a bit of butter or olive oil and cover for 15 minutes. Add white win, garlic and bouquet garni and let it cook slowly for about 1 hour. Remove the garlic, the bouquet garni and set aside the pieces of poularde sot hey stay hot. In a bowl, wisk the crème fraiche and truffle mixture with the egg yolks. Add this preparation to the juice in the bottom of the saucepan while continuously stirring and never boiling.. Let sauce thicken by mixing non stop. Place a piece of poularde on a plate and pour sauce on top. Decorate each plate with the slices of truffles you had set aside.